Sumer Verma was born in 1975 in Mumbai. In October 2013 he had a solo exhibition, Ode to the Sea at Gallery 7, Kalaghoda in Mumbai. Beneath the secretively opaque surface of the sea, there is vibrant colour, exquisite form and fluid movement combined with a tranquil suspension of time and matter. This world has inspired and shaped Sumer’s life for nearly two decades now, and has become his profession, his muse, his subject and his medium. Sumer is one of India’s most experienced SCUBA Diving Instructors and has brought hundreds of people into the ocean through diving. His underwater photography and filmmaking has also brought the ocean into the lives of many more. Sumer finds endless inspiration in the sea. Through his photographs he shows us the majestic sense of space underwater and giant animals that inhabit it, as well as the intricate designs, textures and colours in the minute spaces of a fish scale, a turtle’s eye or the feathered plumes of an oceanic slug. His work is done by spending hours under the surface with SCUBA equipment. It has taken him around the world, from the Lakshadweep Archipelago and the Andaman Islands to the Maldives, Indonesia and the Galapagos Islands. 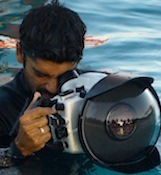 He uses a DSLR camera in a specially designed underwater housing along with submersible strobes. But what aids Sumer the most is his deep understanding of the liquid medium and animal behavior in the ocean rather than his equipment. In a continually fluid environment with ever changing currents, light and flighty subjects, capturing each image is an elusive and challenging labour of love. Having won numerous awards for his wildlife photography work, Sumer also began experimenting with fashion and fine art using water as a medium. He used the softening effects of light moving from air to water, it’s still glasslike reflective qualities and its dramatic waves and bubbles to bring out colours in fabric, the sparkle in jewelry and the grace in the contours of the human body. Sumer Verma’s very consciousness is entwined with the aquatic world and he moves seamlessly from shooting wildlife for National Geographic, Conde Nast Traveller and Greenpeace to underwater fashion editorials for Vogue to underwater sequences for Bollywood, regional and Hollywood films. Sumer is also actively involved with ReefWatch Marine Conservation to educate young people and raise awareness about marine issues.